DETROIT — General Motors is expected to start making significant cuts to its salaried work force — including those in Canada — in the coming week, according to two people familiar with the plans. The cuts, which one adviser on Friday described as "Black Monday," are expected to take weeks, if not longer, to complete, according to the sources within GM, who agreed to speak on the condition of anonymity. GM, according to a separate source, is already nearly halfway to its target of cutting roughly 8,000 salaried employees through voluntary buyouts and cuts to contract workers. In November, GM announced plans to cut 15 per cent of its 54,000 salaried employees in North America including slashing global executives by 25 per cent. The announcement followed 2,250 white-collar employees agreeing to voluntary buyouts — below the company's target of roughly 8,000. GM, in a statement to Automotive News, said: "We are not confirming timing. Our employees are our priority. We will communicate with them first." The automaker, which previously said the layoffs would occur in the first quarter, started cutting some white-collar contract workers in November. The cuts to contract workers, according to one source, were around 1,500 — bringing the total number of employees who have already left the company to 3,750. The workforce reduction was announced in conjunction with the potential closure of five North American plants, and two elsewhere. The plants include the scheduled closure of Oshawa Assembly in Canada by year end and the potential closure of Lordstown Assembly in Ohio, Detroit-Hamtramck Assembly in Michigan and two powertrain operations in Michigan and Maryland. Production is scheduled to end at the plants throughout the year. GM has said it expects the moves to contribute $6 billion (all figures USD) in annual cash savings by 2020 — $4.5 billion in cost reductions and $1.5 billion in lower capital expenditures. While Wall Street has praised the actions as proactive ahead of a potential industry downturn, the company has faced mounting pressure from the UAW, politicians and the Canadian union Unifor, which launched a media campaign against the company. 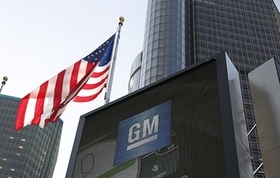 David Kudla, chief investment strategist for Mainstay Capital Management, said the firm expects GM to face more political and public backlash as the cuts are implemented. He referred to the automaker beginning the workforce reduction this week as "Black Monday." GM's cuts are the largest since the automaker emerged from bankruptcy in 2009. A year prior to then, the automaker announced plans to reduce its global white-collar work force by 10,000. As GM makes its cuts, its largest crosstown rival, Ford Motor Co., is preparing to cut an undetermined number of its 70,000 salaried workers globally under an $11 billion companywide restructuring led by CEO Jim Hackett.